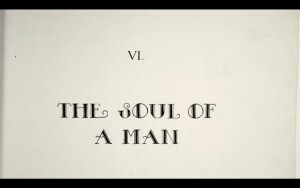 “The Soul of a Man Speaks” (which we’ve shortened to “The Soul of a Man”) is Clement Wood’s title for Chapter VIII. The entirety of Chapter VIII is dedicated to a lengthy analysis of a dream Brinkley has one night. It’s the single most amazing chapter in that book (see also note 294).